Fall is finally kicking in and with cooler temperatures you start to miss the warmer days of summer with a pinch of spring´s cooler nights, thought the colors are beautiful, at some point you´ll find yourself daydreaming about a paradisiac beach, in terms things to do in Cancun here are a few good reasons why you should travel to Cancun this Winter. 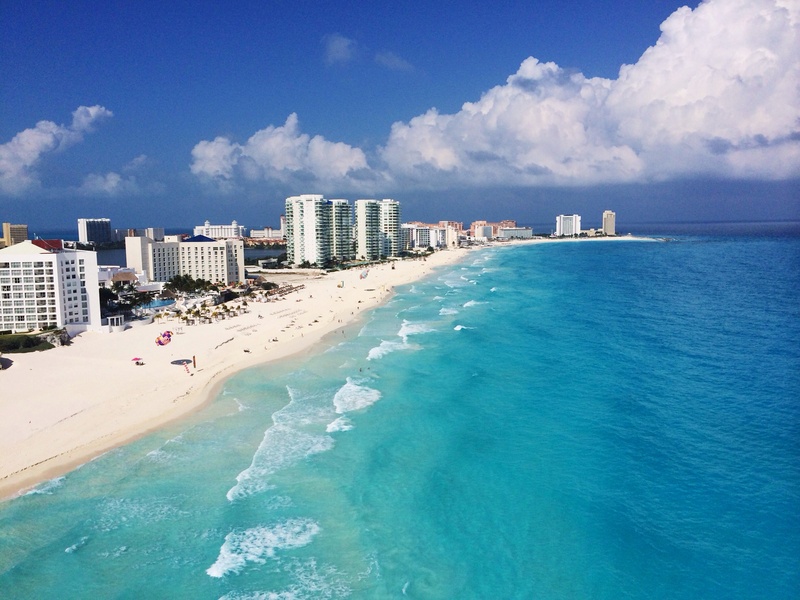 From November to early May, Cancun has the most perfect weather someone could ask for with an average temperature of 29º degrees Celsius during the day and 18º degrees at night. Warm enough to sunbathe and walk around in a bikini and cool enough to wear your favorite pair of jeans. This is where all the major hotel chains are located as well as shopping centers, restaurants and Cancun´s Party Center. As seen from the air has the shape of a “7” which already makes it unique, you have by one side the amazingly beautiful beaches and the Nichupe Lagoon system on the other side. In both shores there are plenty of fund things to do, where to stay is your call! With 25 kilometers of powdery white sand and more shades of blue that you could name, a gorgeous beach is never on shortage. There are 9 main public beaches to choose front in case you decided to stay on the Nichupte Lagoon side or in the city´s energetic – and cheaper – downtown area. Sip Margaritas on a lounge chair, skim across the water on a wave runner or even take a bird´s eye look at the city while parasailing. Cancun is located in front of the Mesoamerican Reef, also known as “The Mayan Reef” which goes from the north east of the Yucatan Peninsula all the way south to Honduras. Needless to say that Cancun and neighboring Riviera Maya and Cozumel are world class scuba diving destinations and with surreal places like Cancun´s Underwater Museum there´s no doubt you will have a treat. Nature has been good to the Yucatan Peninsula since the area has a wide range of biodiversity and echosystems within kilometers away. From jungles to underground rivers, sand dunes and mangroves sprinkled with cristal clear sinkhole pools you can snorkel there, zip line from tree top to tree top or rappel down to the mayan underworld, the toughest thing to do will be deciding what to do first. Even if Cancun is not known as a culinary destination within Mexico, it does certainly has the best samples of food from all over the country as well as other parts of the world. What you should not miss is trying the distinctive yucatecan food, try delicious dishes such as the signature Cochinita Pibil (slow roasted pork marinated in bitter orange and achiote), Stuffed Chili, Lime Soup ore ven a mega fresh ceviche by the sea. The infamous nightlife of Cancun is well known in basically every corner of the planet, in fact, it can be so intense that in more than one occasion has earned it the title of “Spring Break Capital of the World”. But is not all about girls dancing on tables, there are super fun nightlife options for everybody, from a pirate dinner show for all the family to the impersonations and burlesque performances in Cancun´s Party Center or a real mexican fiesta on a trajinera boat at Xoximilco Cancun; when it comes to nightlife in Cancun it all up to you. Not only because is a world class vacation hub but Cancun is really a cultural melting pot with an ever growing expat community from all 5 continents as well as people from all over Mexico, this is a flourishing town where people are always happy to see you and help you whenever you need it; from giving you the right directions to get somewhere to helping you find the best prices as if you were a “cancunense” you will fall in love with the sun, the sea and its people, all in one. As much as there are many other reasons to travel to Cancun this Winter, we know you value your time we only reffered to those things that we felt were the most important to take into consideration when you book your winter holiday vacations. Once again, its your call!